Digital modes allow for crystal clear encrypted communication. 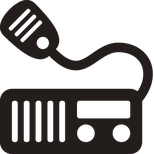 There are three main types, most radios will only use one type and they are incompatible with one another. Which one you choose often depends on how and where you want to use your radio.